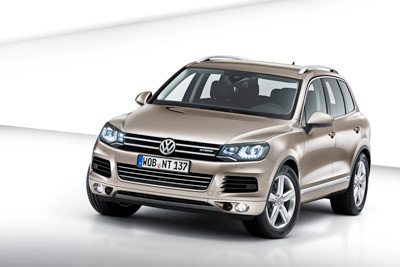 Volkswagen have unveiled the completely redeveloped Touareg in Germany. Volkswagen claim it is the most technically innovative “VW” since the brand has been in existence. The new Touareg is the first Volkswagen and SUV from Europe that will be available in a Hybrid version. With its combined fuel consumption of just 8.2 l/100 km the Touareg Hybrid sets new standards among full-fledged SUVs with petrol engines. Naturally, its CO2 emissions are low too: 193 g/km. The hybrid drive as the top powertrain option combines the power of a classic eight cylinder engine with the fuel economy of a six or four cylinder engine. It replaces the previous V8 petrol engines in Europe and America and carries on Volkswagen’s successful downsizing strategy. Consequently, the V10 TDI and W12 engine versions of the previous model are no longer being offered either. − ideally suited for hybrid and towing duty − and the hybrid module that is integrated between the internal combustion engine and the automatic transmission. This compact module with disengagement clutch weighs 55 kilograms. Located downstream of the V6 TSI, it integrates the disengagement clutch and E-Motor (34 kW/47 PS) in one housing. When the V6 TSI and E-Motor work simultaneously (boosting), a total power of up to 279 kW /380 PS is generated with a maximum torque of 580 Newton-meter as measured on the dynamometer. 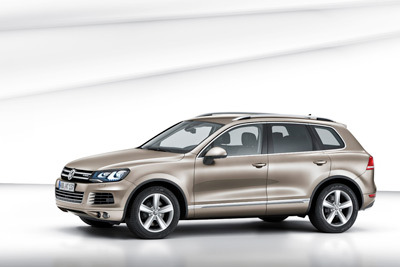 Volkswagen has chosen a parallel hybrid drive configuration for the Touareg. In contrast to other potential hybrid systems, it assures excellent off-road performance and unlimited continuous climbing ability. With a maximum trailer payload of up to 3.5 tonnes, the Touareg is also an ideal towing vehicle, even in the hybrid version. Moreover, the parallel hybrid is more efficient than alternative hybrid concepts on long-distance and freeway journeys. Efficiency gaines have been made by shedding 208 kilograms in the base version whilst at the same time improving torsional rigidity by five percent. Designers also attained a significantly improved Cd value. Along with aerodynamic refinement efforts, another factor at work here is that this Touareg is built lower to the ground than the previous model. Together with front end styling based on the new Volkswagen design DNA, this results in a smaller frontal area. All engines in the second generation Touareg will be fitted with a standard 8-speed automatic transmission – a first in this market segment. The weight and aero refinements together with engine and transmission refinement results in significant fuel economy advantages over the previous model; in some cases the advantage is far greater than two litres per 100 kilometres. Also modified in pursuit of reduced fuel consumption was the standard all-wheel drive. In the base version (“4Motion”), all new generation Touaregs have all-wheel drive with Torsen limited-slip differential (4MOTION; climbing ability: 31 degrees). Like the Tiguan Track & Field, the Touareg also has an “Off-road driving programme”, which − at the press of a button − tunes the ABS, EDS and ASR for off-road duty, activates Hill Descent Assist and adjusts the automatic gearshift points. lock. Equipped like this, the Touareg can conquer any terrain on Earth. Volkswagen has not only made the new Touareg lighter, more fuel efficient and an agile performer; it has also made it into an even more versatile, all-round vehicle. The new interior was made more functional, the seats more comfortable and leg room in the rear is larger. Now the rear bench seat has 160 millimetres in longitudinal adjustment, and the backrest angle can be adjusted. Electrically unlatched at the press of a button as an option, it folds down in seconds and frees up 1,642 litres of cargo space. Already standard equipment in the base version is a radio-CD and info system, which is intuitively controlled over a 6.5-inch touch-screen. The parking brake is now activated by pushbutton. The engine (V6 versions) automatically shuts off at traffic lights and restarts as soon as the driver releases the brake pedal (Stop-Start system). As an option, the tailgate can be opened and closed by a RF remote control unit integrated in the car key. The largest panoramic sunroof of all SUVs provides for light even on overcast days. 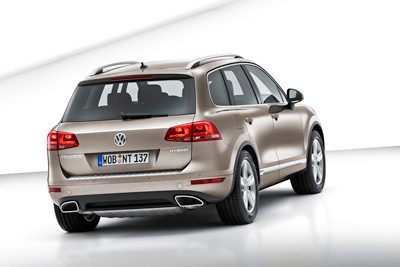 The innovative “Area View” utilises four cameras to detect the Touareg’s surroundings and this enhances safety. Also offering protection are up to nine airbags. Front Assist can brake to a stop in an emergency and tension the seatbelts as a precautionary measure. Bi-Xenon headlights with Dynamic Light Assist perceive oncoming traffic and adjust the light beam to eliminate unwanted glare, and adaptive roll compensation ensures that the Touareg sits solidly on the street. For the first time, there will be special features on the new Touareg under the new “Exclusive” badge from Volkswagen Individual. Options that can be ordered include 19-inch alloy wheels (“Girona” type), fine wood inserts (“Olive Ash”) and a leather interior (“Nappa”) in the two-colour combinations “Dark Burgundy/Titan Black” or “Pepper Beige /Titan Black”. 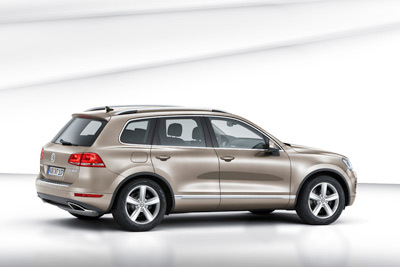 The Touareg will commence deliveries in Europe in April with Australia to follow some time later. Details will be released closer to the local launch date.